Our Wonderful hosts Ellie and Nikos, so kind, nothing was ever too much trouble. 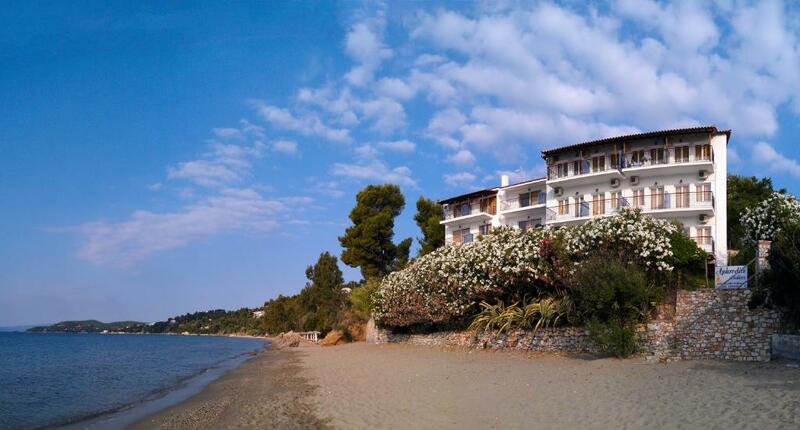 Location was perfect, right on the lovely beach with many tavernas, never a problem finding a sun lounger. 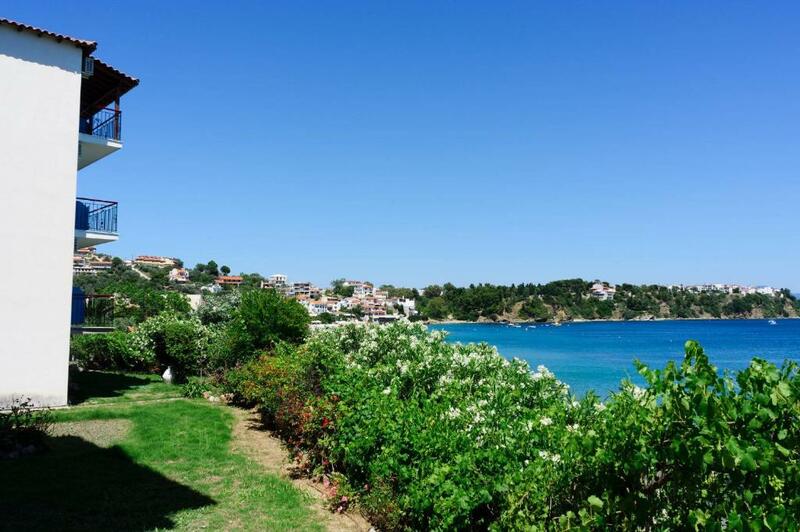 An easy 15 minutes stroll to the town either along the road or along the beach. Great views from our balcony of the bay and across to the main town. Very comfortable beds and lovely soft pillows. Very quiet at night, no traffic noise whatsoever just the sound of the waves. Everywhere spotlessly clean, plenty of wardrobe space. A good bathroom with storage for toiletries. Always plenty of hot water. Efficient and quiet air conditioning. A full sized fridge and kettle in the room. A supermarket just across the road and two more nearby which was very convenient. 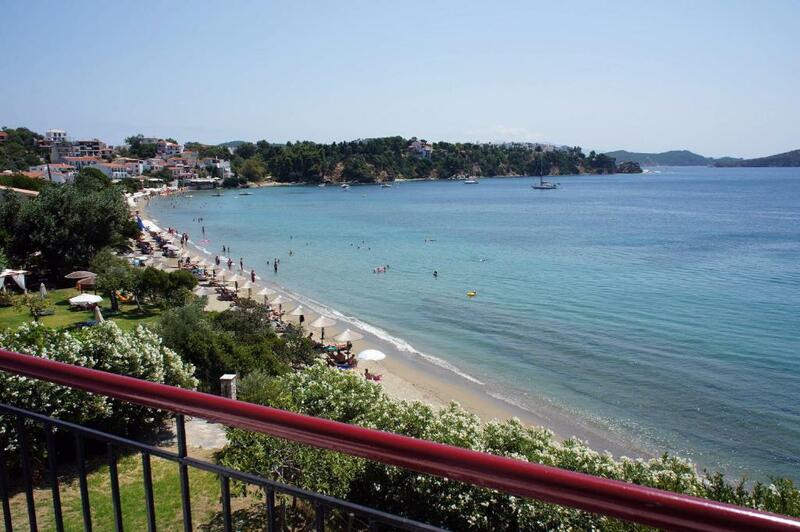 We had a wonderful holiday in Skiathos and staying here helped make it as good as it was. We would definitely recommend it and one day hope to return. excellent hosts. amazing location. would recommend everyone to book here instead of any other place in the island. The room was a lot bigger than we expected and the view from the balcony was just lovely. It was great to just be able to go down some steps and be on the beach. Also loved the sound of the waves lulling you to sleep, except the one night we had a thunderstorm, but that was exciting! Best thing was being able to leave our luggage in our room on check out day until our taxi came at 7pm. Couldn't fault the service! Clean. Well considered beach accomodation. Very friendly staff. First rate service. Right on the beach. Close to town. Good restaurants within walking distance. Good WiFi. Nothing too much trouble. Hosts/staff discrete but very amiable when approached. Beach, bus stop, supermarkets on the doorstep. Town just a 15 min walk away. 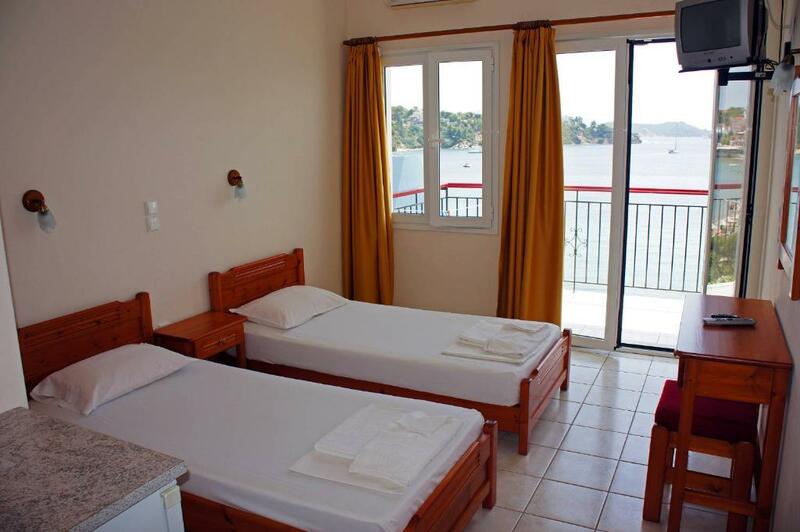 Very clean rooms with balcony giving excellent sea views. 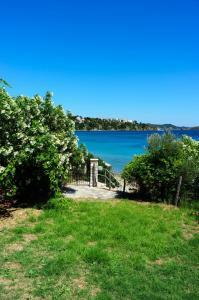 Very well located, right on the beach and just a short walk into Skiathos town. Local Bus Stop, Supermarket and ATM close to the rooms. Helpful and friendly owners, would recommend these studio apartments to anyone. Such a lovely welcome to Aphrodite. Fantastic location on the beach. Comfortable beds in spotless rooms. Adored our stay and hope to return. 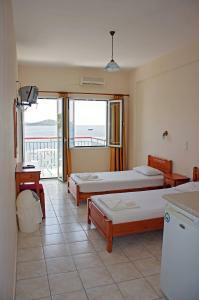 The room has a beautiful sea view and immediate access to the beach. The host is also friendly and helpful. Lock in a great price for Aphrodite Studios – rated 9.4 by recent guests! 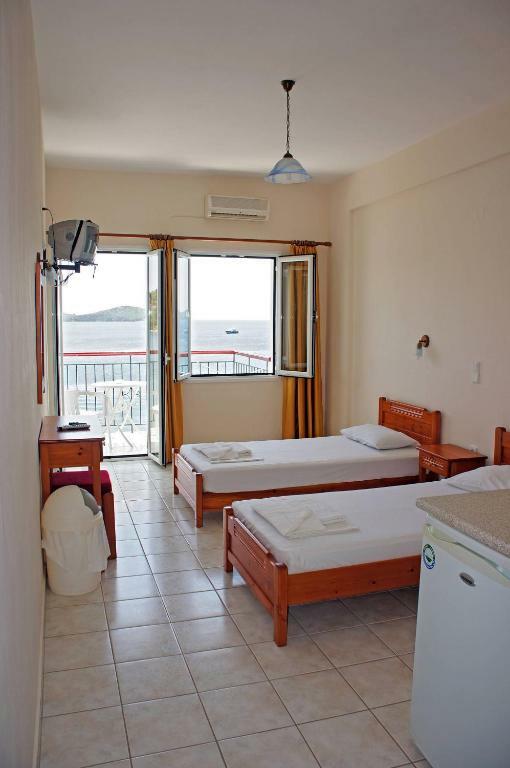 The family-run Aphrodite Studios are located right on Megali Ammos Beach with several taverns serving fresh fish and traditional Greek dishes. 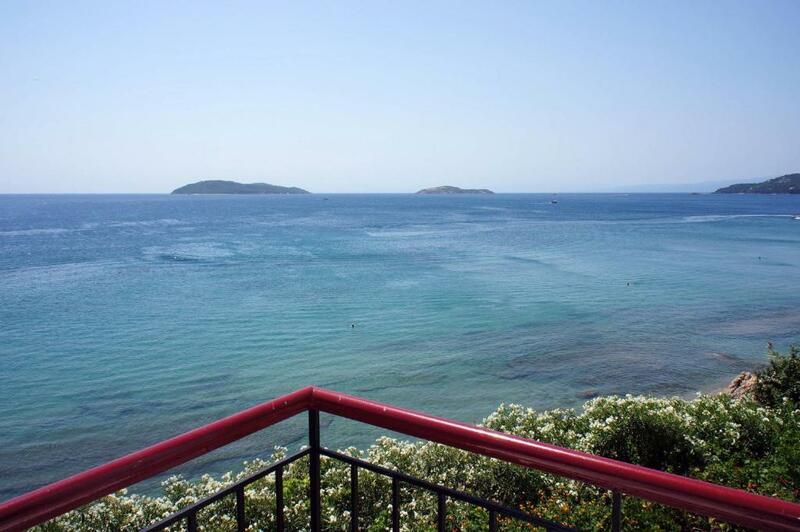 They offer air-conditioned rooms and studios overlooking the Aegean Sea from their spacious balcony, as well as free WiFi. Bright and spacious, all rooms and studios are simply furnished and come equipped with a mini fridge, TV and wardrobe. Each has a private bathroom with a shower, while some also include a kitchenette. Some rooms are fitted with beamed ceilings. 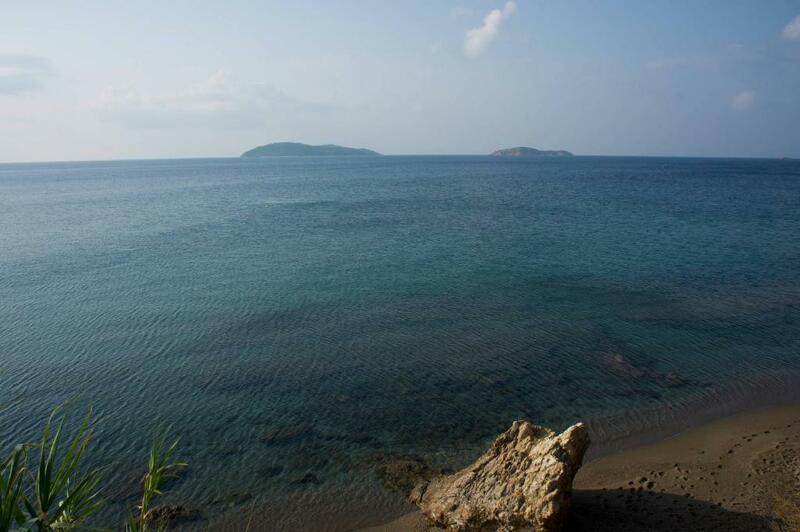 Guests can find a bus stop at just 30 feet from Aphrodite Studios, in order to visit all beaches of the island. The main town of Skiathos is at 0.6 mi, while Skiathos Airport is 1.9 mi away. Public parking is available in the surrounding area. 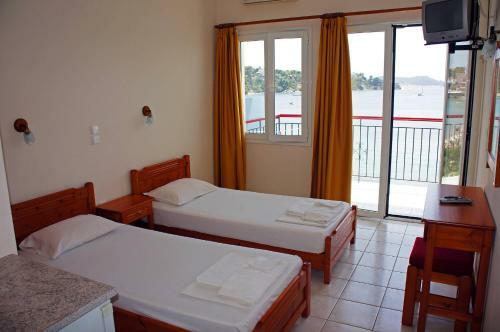 When would you like to stay at Aphrodite Studios? Please note that this room type is not suitable for babies. 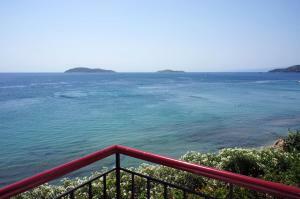 Air-conditioned studio with balcony and Aegean Sea views located right on Megali Ammos Beach. Boasting a beachfront location at Megali Ammos Beach, this air-conditioned room enjoys Aegean Sea views from its balcony. It has a wooden roof and includes a fridge, an electric kettle and a TV. Boasting a beachfront location at Megali Ammos Beach, this air-conditioned room enjoys Aegean Sea views from its balcony. It includes a fridge, an electric kettle and a TV. House Rules Aphrodite Studios takes special requests – add in the next step! Aphrodite Studios accepts these cards and reserves the right to temporarily hold an amount prior to arrival. Kindly note that the property does not have a 24-hour reception desk. Please inform Aphrodite Studios of your expected arrival time in advance. You can use the Special Requests box when booking, or contact the property directly using the contact details in your confirmation. Great location and friendly hosts. Super clean - our sheets and towels were changed every couple of days and there was the personal touch in the cute patterns the housekeeping staff folded our nightwear into on the bed each day. Nikos and Elli are amazing hosts and even left me a little surprise present in the room on my birthday. Nikos very kindly took my very heavy suitcase up the stairs for me to the taxi when we left which was very kind. The location is excellent. We made the mistake of following the main road into town on our first night but luckily discovered the alleyway which leads to the smaller road that follows the beach. If you keep on the same side as the Aphrodite when heading towards town, the alleyway is located between the property with the white wall and black iron gates and the supermarket (with the Greek flag). Head down the slopey alley and and turn left onto the small road which will lead you to town. The Aphrodite is right on the beach and even though we were on the lowest floor the view was spectacular. The bus stops are right outside plus there are 2 supermarkets close by - one opposite the road with the friendly man and the miserable woman and the other, larger supermarket (the one with the Greek flag) on the same side as the Aphrodite and just a bit further along which was very friendly and sold English newspapers too. The Aphrodite is the perfect place to stay in Skiathos and comes highly recommended! Thanks again to Nikos and Elli for making our stay a very happy one! The bathroom is rusty. The water in the shower is salt water which can make it less comfortable to take showers or brush your teeth as it tastes horrible.